Pregnancy is not a time to take chances with your diet. Tulsi tea, also known as holy basil, has been consumed for thousands of years in the Indian culture, but there's not enough information about how it might affect your pregnancy. Consult your doctor first before sipping. The tulsi plant is a member of the basil family, and its tea has a minty sweet taste. In Ayurvedic medicine, it's recommended that you consume the tea daily to promote good health, prevent disease and help manage stress. It's also recommended as a treatment for a number of conditions, some of which you may experience during pregnancy, such as vomiting, indigestion and back pain. It's important to note, however, that evidence to support use of tulsi tea for these ailments is based on animal and test tube studies. Clinical trials need to be conducted to confirm these benefits. Currently, there is not enough information as to the safety or efficacy of drinking tulsi tea during pregnancy. Drugs.com reports that there is conflicting information about how the tea may affect your baby. Some toxicity studies on rats have found that high doses of the tea impacts health of the rat fetus, while other studies have found no ill effects. Stay safe and don't drink tulsi tea until you've checked with your doctor. 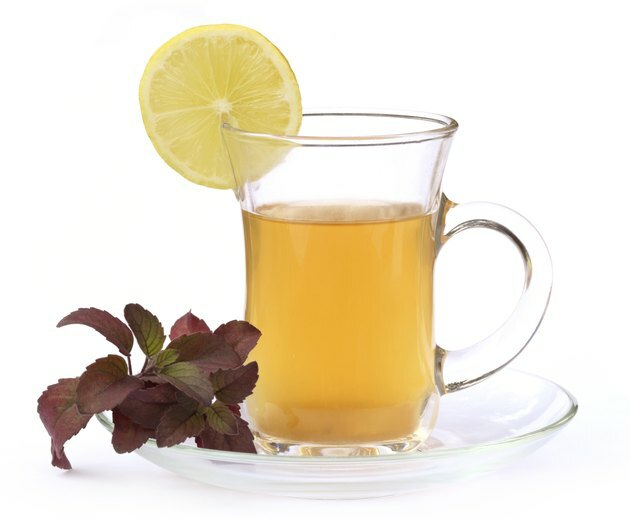 Instead of tulsi, consider adding a tea that's known to be safe to drink during pregnancy. The American Pregnancy Association reports that red raspberry tea is a safe tea for pregnant women, and drinking it may help decrease labor time. It's also a source of iron. Peppermint tea is considered a safe tea for pregnancy as well and may help relieve nausea, says the association. While diet is an important aspect of your pregnancy, what you don't eat, or drink, is as important as what you do. The reason it's so important to be mindful of your food and drink choices is because of how it might affect your baby. Avoiding certain foods may reduce risk of birth defects. Although tulsi tea has been consumed for thousands of years, being cautious about drinking it during your pregnancy may be better for your baby. Davidson's Tea: What Is Tulsi?